Study Geology & Geoscience to explore Earth from the surface to the core. Apply scientific tools of chemistry, physics, and biology to discover what controls the distribution of Earth’s natural resources. Enter into an exciting and flexible career as a professional geoscientist exploring 4.5 billion years of Earth's history, to discover how, why, and when our planet came to be the way it is. Understand your existence in the context of deep time and the Earth’s evolution, including tectonics, biological evolution, and geochemical systems at the Harquail School of Earth Sciences. Learn about environmental geoscience, geophysics, economic geology, geochemistry, oceanography, mineralogy, volcanology, sedimentology, and hydrogeology. Students with an interest in earth sciences and environmental sciences can enter into the Environmental Geoscience program to study environmental interactions between geology, biology, and hydrology. Is Earth Sciences (Geology) for you? Are you curious about the solar system, how our planet formed, how minerals and rocks form, what makes volcanoes and earthquakes, why minerals have different colours, how the Earth and life evolved, how we know the age of the Earth, what causes climate change, how do you find an ore deposit? Do you enjoy the outdoors, hiking, camping, exploring exotic, distant places, working with computers, global problem solving, integrating scientific disciples (biology, chemistry, and physics)? Then Earth Sciences are for you! Surrounded by the outdoors and world class geology in Northern Ontario, students have a setting for field-based learning and research that cannot be duplicated elsewhere. Travel worldwide exploring the outdoors, hiking, camping, making geological observations, while still being a scientist back in the lab. Take part in national and international field trips, mining conferences, and geological talks. Studying in a hub of exploration and mining companies, federal and provincial geological surveys, and scientific research centers, students have the opportunity to find great summer jobs. Geology opens up a flexible career that can change with time based on your life experiences and geological interests. The four-year B.Sc. in Earth Sciences is designed to meet the minimum knowledge (academic) requirements for registration as a professional geoscientist (P.Geo.) with the Association of Professional Geoscientists of Ontario (APGO). Registration with the APGO will significantly enhance career prospects of Earth Sciences students. Choosing Laurentian for my studies is one of the best decisions I have made. The Earth Science program at Laurentian is special because Sudbury has world class geology, world class mines, and a world class learning environment. Sudbury's unique location allows students to see fascinating geology impacts without even leaving the campus. With all my classes located in the Ministry of Northern Development and Mines: Willet Green Miller Center, everyday I am interacting with all different types of geologists, geoscientists and researchers who are working for the government in my field. With hands-on labs, studying minerals and fossils of all different ages, a field course seeing world-renowned geology from the Sudbury meteorite, and field trips that take students all around the world, I consider the Earth Science program at Laurentian to be an immersive learning experience that is unparalleled. The Earth Science program is for anyone who enjoys adventure and science hand-in-hand. Learning how the earth formed, earthquakes, volcanoes, re-greening, and mining is all geology, and it can take you to places all around the world, and within Canada that you would otherwise never visit. Laurentian has the tools and support to help you complete your education. The free online courses they offer on researching, studying, and how to write a university paper help you transition out of highschool into the university environment. Peer navigators like myself guide new students with the transition until they are comfortable in the university setting. 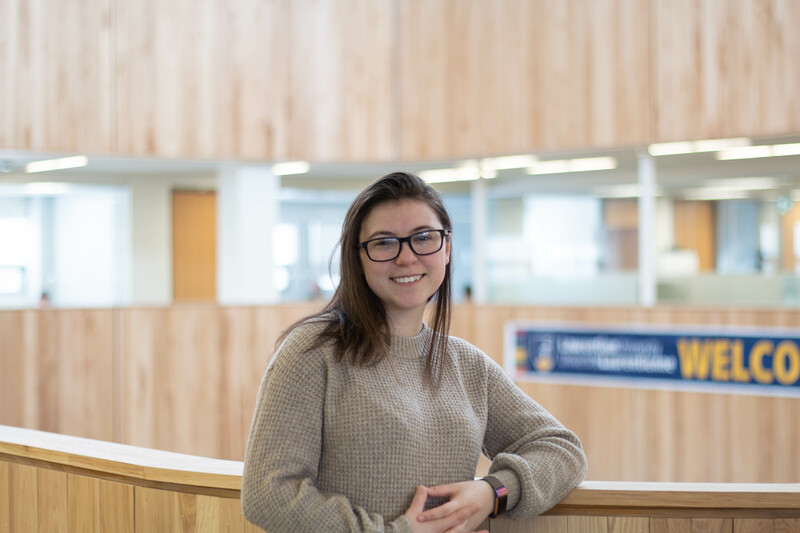 Our support programs such as academic advising, student life mentors, and free tutoring in difficult first year classes, all help make Laurentian university a great place to complete your degree.